Be the first to share your favorite memory, photo or story of Patriciann "Pat". This memorial page is dedicated for family, friends and future generations to celebrate the life of their loved one. 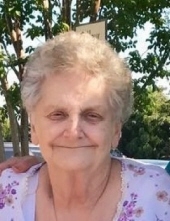 Patriciann Dale Miller, age 77 of Gordon, Pennsylvania, passed away Monday, January 14th, 2019 at Geisinger Medical Center, Danville, surrounded by members of her loving family. Born on September 12th, 1941 in Butler Township, Pennsylvania, she was the daughter of the late Leon Stabler and Almeda Umholtz Stabler. Pat went on to be a very social gal who made everyone happy with her sweet smile and jokes. She worked at Rickards Dairy in Gordon and after graduating from Butler Township High School, she spent time working as a secretary in Harrisburg. After marrying her best friend, the late Raymond Miller, she lived in Palmyra, PA before moving back to Ashland and eventually, Gordon. Pat was a long time member of the Citizens Fire Company in Gordon for 40 years. There she enjoyed playing cards with her husband, Raymond, and friends. Pat loved spending time with her family. Family meant everything to Pat and she especially adored when they were gathered around the table catching up, playing cards, or enjoying a great meal. Her selflessness and caring attitude were something inspiring to those who she surrounded. Pat was someone who could brighten your day with just a few words. She had a very outgoing personality that brought joy to others. Pat loved watching crime shows and HGTV. She also enjoyed looking after Raymond’s 50 cats. She was preceded in death by her beloved husband, Raymond Miller, her brothers Warren and Larry Stabler, and her sister Dawn Sauers. She is survived by her three siblings Marion Stabler Raff, Lynn Dietrick Stabler, and Dewey Stabler. She is also survived by five children and their families. Her sons Raymond L. Miller and his wife, Janene Miller, Pasadena, Md., and Scott Miller and his wife, Diane Miller, Lavelle; her daughters, Cathy Canfield, Ashland, Susie Yashin and her husband, Steve Yashin, Ashland, and Jan Miller, Harrisburg. She also has five granddaughters and four great-grandchildren. Funeral Services will be held 11:00 AM Wednesday, January 23, 2019 at the Kull-Heizenroth Funeral Home, Ashland with Susan Hocking C.S.M officiating. Visitation will be 6:00-8:00 PM Tuesday, January 22 and 10:00-11:00 AM Wednesday, January 23 at the funeral home. Interment will be at the convenience of the family. To send flowers or a remembrance gift to the family of Patriciann "Pat" D. Miller, please visit our Tribute Store. "Email Address" would like to share the life celebration of Patriciann "Pat" D. Miller. Click on the "link" to go to share a favorite memory or leave a condolence message for the family.